Tu B’Shevat is the Jewish festival to celebrate the New Year of the trees. Honoring our agriculture and lunar cycles, this holiday traditionally falls on the 15th in the Hebrew month of Shevat and is celebrated by planting trees, spending time in nature, going barefoot, and eating foods that come from trees. 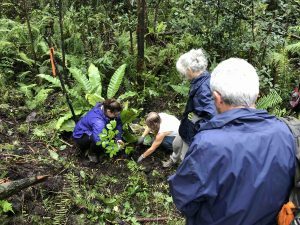 The Ahava ‘Aina congregation joined forces with Malama O Puna to celebrate by giving back to the ‘aina, planting native tree species in Hawaii’s last remaining lowland rainforest, Keau’ohana Forest Reserve. They planted ‘ohe in an effort to help restore this sacred native land. Rabbi Rachel blessed the forest in honor of the holiday and offered a prayer for celebration, restoration, growth and new beginnings. Environmental Specialist, Jaya C. Dupuis, the project coordinator who manages the forest restoration project, educated the Ahava ‘Aina community on native plant species, invasive species, forest restoration, and the many ways we can help our ‘aina to flourish. Jaya conceived the forest restoration and has been the driving force behind the project since 2014. Volunteers cleared areas for planting and worked together to plant the trees. This will help to reestablish the shade lost due to invasive species, and more currently, to rapid ohia death. Malama O Puna generously donated the ‘ohe trees for the Ahava ‘Aina community to plant in Keau’ohana, having been grown from seed specifically for the forest restoration in their Kapoho native plant nursery. 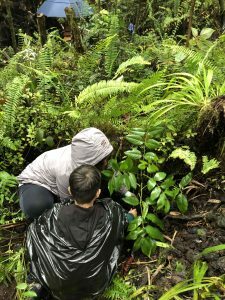 Despite the thunderstorms, Ahava ‘Aina was able to plant ten new trees in Keau’ohana Forest Reserve. Those interested in learning more about Jewish culture or joining Ahava ‘Aina should contact Rabbi Rachel Short or visit www.AhavaAina.org. 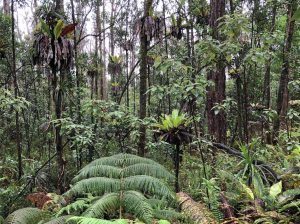 Those interested in volunteering for forest restoration should contact Jaya Dupuis or visit www.MalamaOPuna.org/Keauohana.